Jehangir Ratanji Dadabhoy Tata, was born on July 29, 1904 in Paris. 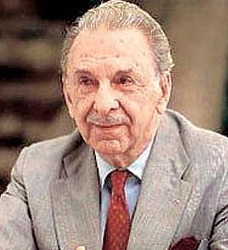 He was the second child of Mr Ratanji Dadabhoy Tata. He spent much of his childhood in France since his mother was French. In 1922, Tata returned to India to join the family business. He inherited most of his grandfather Jamshedji's industrial empire but first became a pioneer in aviation. He had a great personality with a charm and style of his own. After his father's death in 1926, Tata became the director of the Board of Tata Sons Ltd. Eventually in 1938, he became the chairman of the company. Under his leadership Tata Sons expanded into one of the largest industrial empire in the country- from ironworks and steelworks into chemicals, hotels, engineering and lot of other industries. In 1945, Tata Steel promoted the Tata Engineering and Locomotive Company (TELCO) with an objective to produce locomotives for the Indian Railways. Today Telco has emerged as the country’s largest Commercial Vehicle producer. JRD Tata was the first Indian pilot to qualify for a British private license. He founded Tata Airlines in 1932 and by 1953, it developed and came to be known as Indian Airlines. Till 1978, Tata was the Chairman of the Indian Airlines and Air India. Tata was an early advocate of family planning and he created the Family Planning Foundation in 1971. His innovations in India's fledgling hotel and tourist industry as well as his contributions to scientific and technical research and corporate management gained public recognition from the Indian Government. He was honoured by India's highest civilian award, Bharat Ratna in 1991 and United Nations Population Award in 1992. In 1991, at the age of 87, Tata retired from Tata Sons. He passed away on November 29, 1993.